These three words give clear purpose and direction for your Men’s Ministry. Do all three well and you unleash the power to change men and see them influence others. 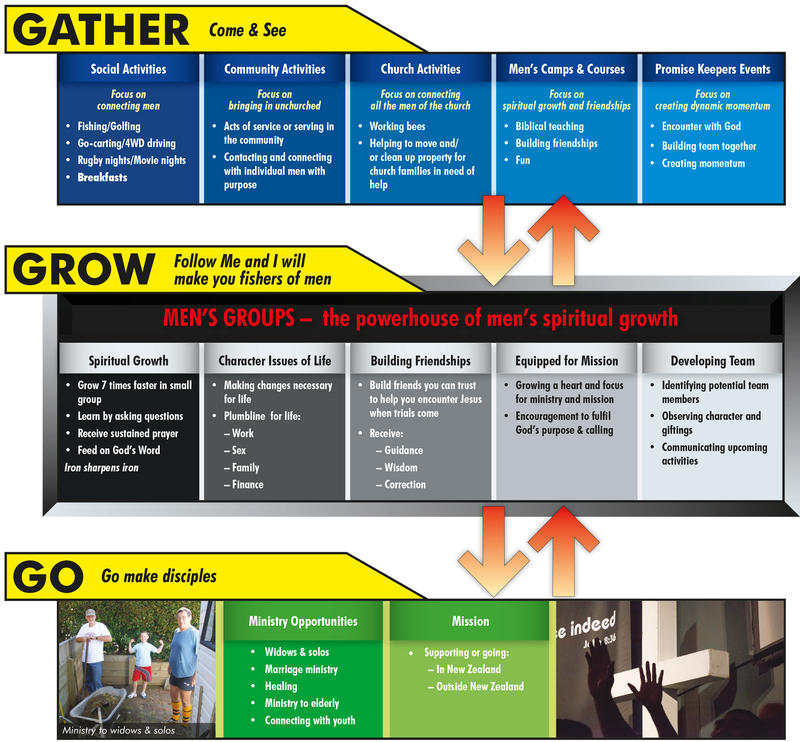 By keeping men’s groups as the central mainstay of the ministry, men become involved on different levels of “gather” and “go”. Strong interconnections are a vital strategy for success. How Promise Keepers can help you to energise your Ministry with Men! The focus on “gathering activities”, such as men’s breakfasts, courses, camps and events, is to provide opportunities to bring men from the congregation together, as well as unchurched men. This should be seen as a starting point to building friendships and growing spiritually. Obviously some activities should have a different focus. Some will emphasise making contacts and strengthening friendships, others will provide opportunities for spiritual growth. Unfortunately in a large number of Men’s Ministries across the nation, gathering activities are the only type of men’s activities that take place, and these do not take men to the next level of greater spiritual growth and building real friendships. As a result they miss out on the real potential and power of men in the church. Men's groups should be at the very centre and heart of Ministry with Men in the local church. When men gather together weekly as part of a group, they experience growth as they learn to pray for others effectively, apply the Bible to their lives and harness the power of each other’s experience and wisdom while building friendships. Regular attendance at a men’s group will activate spiritual growth up to 7 times faster than only attending Sunday church services. This is because most men learn by asking questions which is not possible during most regular Sunday services. By asking questions they are able to apply truths and receive biblical wisdom from other men in the group at a pace that they can understand and implement. Men grow in groups - whether they are open or closed groups. Men frequently are confronting issues that require time, sustained prayer, encouragement and perseverance to be resolved and overcome. These issues may be associated with character, faith, relationships, work, family or finance. Men receive discipleship and mentoring from the group which gives them the necessary guidance, wisdom and correction to confront and overcome these challenges. As men get to know each other they see character, leadership qualities and potential in others. These men can form the nucleus of multiple teams to organise “gathering events” to continue drawing men into the church. Every church needs an open men's group. When a new man arrives at church on a Sunday and asks what is available in Men's Ministry that week, it is likely that the only opportunity for him to participate in Men’s Ministry will be in an open men's group that meets weekly. Meeting weekly provides consistent opportunities to invite other men from both inside or outside the church to attend. Over time, men’s groups build friendships and grow men spiritually. They also provide an environment where men are encouraged and equipped for mission and ministry. It follows that they will then want to go and fulfil their ultimate purpose in life with ministry and mission. I have been involved in men’s open groups for over 20 years and have come to realise that they are the engine room and powerhouse to gather men, grow men and ultimately equip them to go! We were given the inspiration to be a “band of brothers”. We are a strong team that support each other in their faith and in real life situations and hard times. Men in our group have found the Lord, been baptised, saved, and have manned up to the call Christ has made for each of us. Our Team can help you with Men’s Ministry.